One of my best friends and I each have a dream of owning an outdoor shower. And of course, a house or cabin that would presumably be attached to the outdoor shower. But the shower itself is what represents sandy feet, warm days and outdoor meals. San Francisco’s foggy summer isn’t very conducive to this dream, but I'm in New England for a couple weeks and so far, I’ve encountered two al fresco showers. Needles to say, I’ve almost completely abandoned the concept of washing behind a shower curtain. Here’s a quick project to corral all your outdoor shower supplies. I added drainage holes because I can get skeeved out by mysterious standing water in the bottom of containers. You can embellish it or leave it plain. Either way, strolling to an outdoor shower with a galvanized pail in hand is a fleeting indulgence for me, and it’s one I intend to savor. If you’re using a drill and metal drill bit, drill a few holes through the bottom of your container. Or you can just hammer a nail through the bottom to create holes. 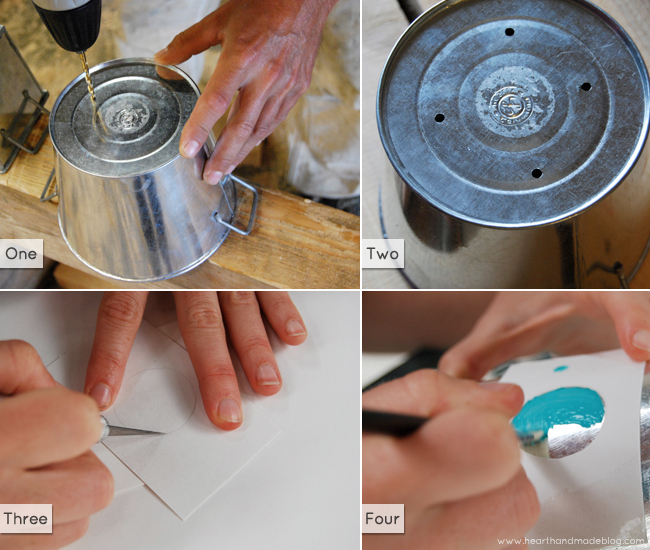 If you want to embellish your pail, you can freehand a design or make a stencil. To create this dot motif, I traced a few round containers (of differing sizes) onto squares of poster board, cut the circles out, and taped the stencil onto the pail. Paint within the cutout circles, let dry, remove the stencil, and hit the (outdoor) showers.